Alex Redenius, Lt. Esteban Pommier and the staff of Owen’s Supermarket. The Kroger Company’s Central Division president Jeff Burt recently challenged his management team to volunteer at different red kettle sites. 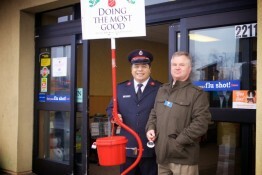 Alex Redenius, district five manager, rang the organization’s bells at the Owen’s Supermarket in Warsaw. “Kroger is completely behind The Salvation Army; it’s so nice to give and spread a little joy in this season.” said Redenius. 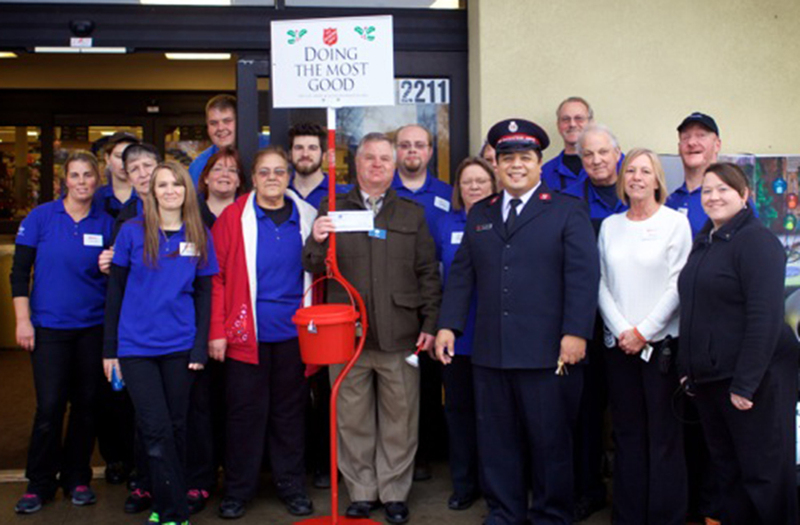 Kroger donated $1,000 to The Salvation Army of Kosciusko County. In addition, $247.44 was raised through bell ringing. “We are very grateful to the Kroger Company for their contribution this year; we only have two more days of bell ringing and the support of our community is crucial.” said. Lt. Esteban Pommier. Lt. Pommier added that although donations are up compared to last year, the organization is still having to make budget adjustments for 2015. “We invite our generous community to help us finish the year well and to continue giving generously.” said Pommier. To assist The Salvation Army with its Christmas fundraising efforts donations can be mailed to P.O. Box 1257, Warsaw.